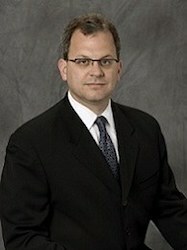 Daniel A. Klein is a partner in the firm. Following graduation from Ohio State University College of Law, Dan was admitted to the Illinois bar in 1990, and the Florida bar in 1994. He practices primarily in plaintiff’s personal injury and medical malpractice litigation. His practice includes a wide range of cases including wrongful death, nursing home negligence, auto accidents, premises liability, construction accidents, FELA, products liability, and wrongful discharge. He has tried hundreds of jury cases and arbitrations to successful verdicts. Dan has recovered millions of dollars in settlements and verdicts for his clients. Recently litigated medical malpractice, trucking accidents, and commercial disputes, resulted in recoveries of $4.8 million, $2.4 million, two results of $1.65 million, and $1.375. He also recently obtained a verdict of $10 million in a construction accident case. Dan was recently voted to the list of Illinois’ top 100 lawyers by the Illinois Super Lawyers, the National Trial Lawyers, and The American Society for Legal Advocates. He has been consistently named to the list of the top 5% of all Illinois’ lawyers. Dan has served as a Chair qualified arbitrator in the Cook County Mandatory Arbitration Program. He is a member of the Chicago Bar Association, American Bar Association, Illinois Trial Lawyers Association, and the Florida Bar Association. Dan was born in Dayton, Ohio, and received his Bachelor of Arts degree from Ohio State University in 1987. Dan credits his success in litigation to his physician father passing down an attention to detail. Dan says his recipe for successful results is summed up like this: "Everyone wants to win. It is not the will to win, but the will to prepare to win, that results in success."